As Cannes judges shortlist their Lions, we talk with creatives about the key decisions that helped them transform their visions into award-worthy campaigns. Here, Droga5 copywriter Adam Noel and art director Jon Kubik discuss the Jay-Z Decoded campaign, which just took home the Outdoor Grand Prix at the Cannes Lions. 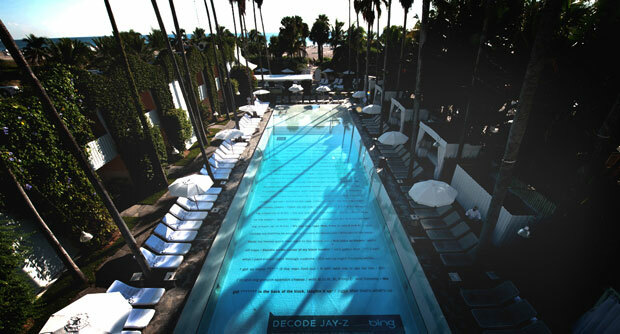 For the release of Jay-Z’s Decoded, agency Droga5 broke new ground in outdoor advertising, media strategy, and open source publishing by releasing each of the memoir’s pages into the world before the book hit stores. The Decoded campaign was actually a dual client brief, Droga5 was charged with creating an integrated campaign for Microsoft’s Bing at the same time as the agency got the brief to launch Hova’s first book. The idea: Put every page of the book into a real world location that in some way spoke to the content on that page. So, while some pages were splashed on billboards, others turned up in less expected locations–like the bottom of the pool at Miami’s Delano Hotel, on pool tables, in the lining of suits. (You can see 32 of the locations in this slideshow.) The campaign also included a Bing Maps-enabled scavenger hunt, allowing the audience to uncover clues as to the location of each page. Here, Droga5 copywriter Adam Noel and art director Jon Kubik discuss some of the turning points in the multi-faceted campaign, which just took home the Outdoor Grand Prix at the Cannes Lions. 1: Have two client briefs and one big idea. We almost made this impossible for ourselves right from the get-go, agreeing to take on two very different yet bold briefs and then coming up with one big idea that united them into a joint campaign. It was a balancing act for us, with twice as many opinions from two powerful corporations that usually get what they want, no matter what. RocNation and Microsoft are big brands, big reputations, big money. We needed to be nimble in order to make sure both clients were continuously obliged and at the same time respectful of our vision. Each needed the other and the idea was made all the better by the joint ambitions. 2: Keep the idea pure. The core idea was to drop every single page of the book out into the real world and then create an online experience that used Bing search and Bing Maps for people to locate all the pages. But the decision that really took it up another notch of difficulty was our choice to put the pages only in locations that were relevant to the content on each page. In essence, we couldn’t just buy a mass load of media and throw all the pages out in one hit like most campaigns do. There had to be a strategy and plan for each and every page; 300-plus media strategies all aimed to tell Jay-Z’s story right where it happened. And often the appropriate media just didn’t exist in these specific locations. As a result we had to create our own media. From a vintage Cadillac wrapped in pages paying homage to the birthplace of New York hip-hop, to a 50-pound bronze plaque in the Marcy projects commemorating Jay-Z’s childhood. The unique placements covered hundreds of thousands of square miles around the globe and were released daily for a month with a collection of scrutinized Jay-approved clues leading to each location [At least one clue was the sole creation of Jay himself, Droga5 CEO Andrew Essex told Fast Company recently: “Ironcially Jay has never been spotted eating pork in this establishment”–a reference to the Manhattan bar and restaurant The Spotted Pig, which Jay co-owns.] The book launch was a month of non-stop executing that constantly changed for Random House’s book edits, vendor capabilities, and budget. In the end, it was our willingness to change tack along the way (without compromising the idea) that saw the campaign such a huge success for all. With that said, not everything went to plan all the time, but our intent and drive made up for any hurdles. 3: Put your life aside for 6 months and hope your loved ones understand. Six months went by without seeing the people that matter most. Some nights we didn’t come home, and when we did, our significant others were already asleep. But in the end, the success of the campaign far overcame the painstaking efforts during production, and we wouldn’t take any of those nights back for the prospect of getting laid.